Sometimes it happens that when starting a trek, we notice that we have forgotten to pack a particular item which was very important and without that the whole trek turns out to be a mess. These days, hiking and trekking is done throughout the year. It starts from mid of June and lasts till April. 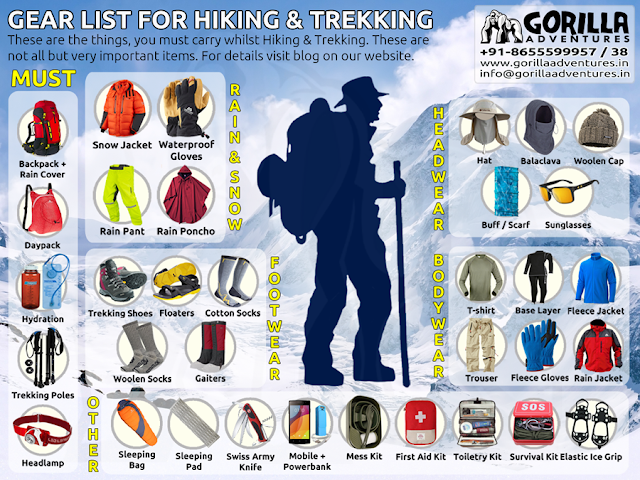 Many people plan for overnight treks, camping and trekking throughout the year. So many times, enthusiasts just stuff their backpack and leave for trek. But sometimes it happens that when starting a trek, they notice that they have forgotten to pack a particular thing which was an important item and without that item the whole trek turns out to be a mess. So here you can find a check list that will help you to crosscheck the items that should be packed in before leaving for a trek; so that you enjoy your trek and nature well! In the checklist, items are given a group name. So even if they are shown separate in the list, you have to pack it in together with the other items in that group. For e.g. all the items with group name 'First Aid Kit' must be kept together in a pouch or kit bag. People think that it is the responsibility of leader to have 'First Aid Kit' and 'Survival Kit' with him. But every participant should keep personal ‘First Aid Kit’ and ‘Survival Kit’ with him/her. One can add or subtract items mentioned in the list according to his/her need but the given list is of minimum items so it is advised to carry maximum items from the list to avoid unnecessary headache. The list is further divided into types of outing. E.g. One day trekking, overnight Trekking and Camping. All the items are ticked as per their need in that particular type of outing. It is advisable to keep all the items required according to type of outing. Do carry almost all the items during camping. 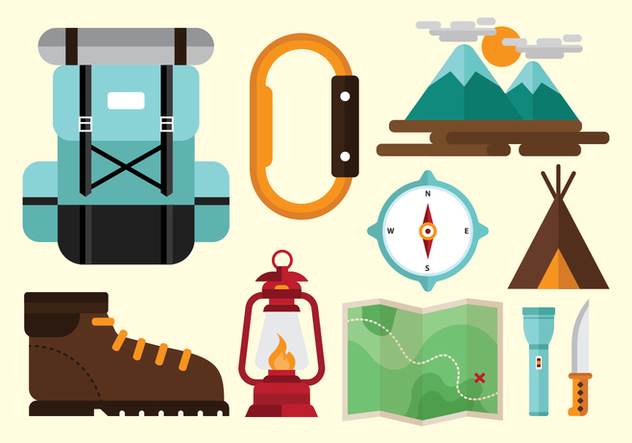 The items shown in ‘Group Items’ must be scattered in the group (as per leader’s directions) during trekking and should be gathered at one place when required. It is the duty of the leader to carry all the items (including few from ‘Group items’). Because he has the responsibility of other participants with him. Remember that a calamity occurs without warning. The checklist seems quite long; but the items mentioned in it are small. They won’t take much place in a backpack but their usefulness is great. For example, what you can do if the outsole of your trekking shoe is broken at a very start of the trek? You just can’t imagine the whole trekking with the broken sole. It will be terrible trek. I myself have experienced it. This is a statement of self-experience. In this situation, an instant glue / solution can fix that broken sole at-least for that particular trek. A roll of utility cord can be useful in fetching water from a deep water tank. Tissue papers can be used for loo when there is unavailability of water nearby. A crepe bandage will be useful to lower pain in the knees and other joints that occurred because of trekking. Use of antiseptic cream will cure abrasion, pricks and cuts. So these items saves us in some or other emergencies for sure. Friends, please don’t keep waiting for an incident that will prove the importance of these items. Carry all or optimum items with you during your outing. Remember one rule that will make all your outings enjoyable - PREVENTION IS BETTER THAN CURE. It is a most important thing we should check everytime when we plan any trek. Thank you Utkarsh for sharing the list.